We are located in the National Reservoir of Tuscania, on top of a tiny green hill with picturesque view and a natural waterfall. 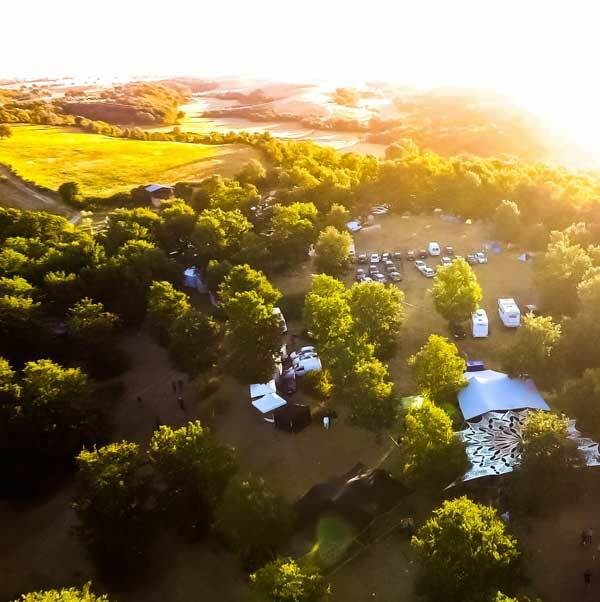 The festival path follows the route of the ancient oak trees and the rich vegetation, so we can benefit from natural shade and admire the beauty of the local flora. At 2 minutes walking from the core of the activities, a magnificent waterfall flows into a small river, where we can freshen-up during the days or go for a visit when we need some peaceful and silent time. In the past editions, small groups of tribal music lovers, have already spotted this as the perfect place for Sound-therapy sessions.. and everyone simply loved it! 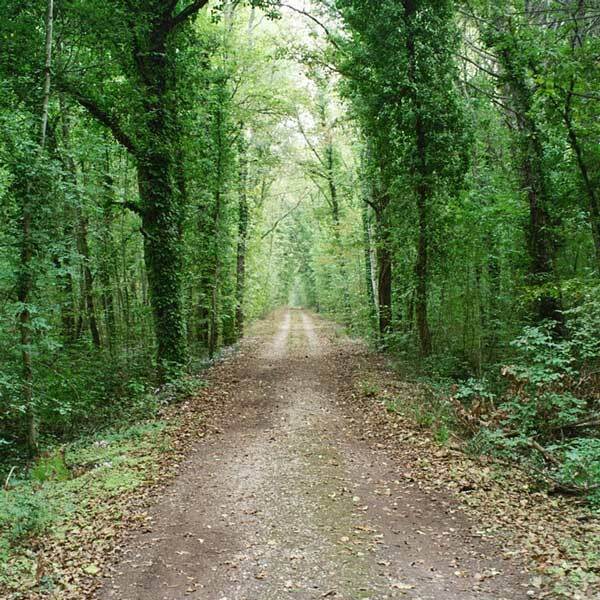 All around us a wide forest area gives us the opportunity for long walks and good air to breath. There are different routes available. 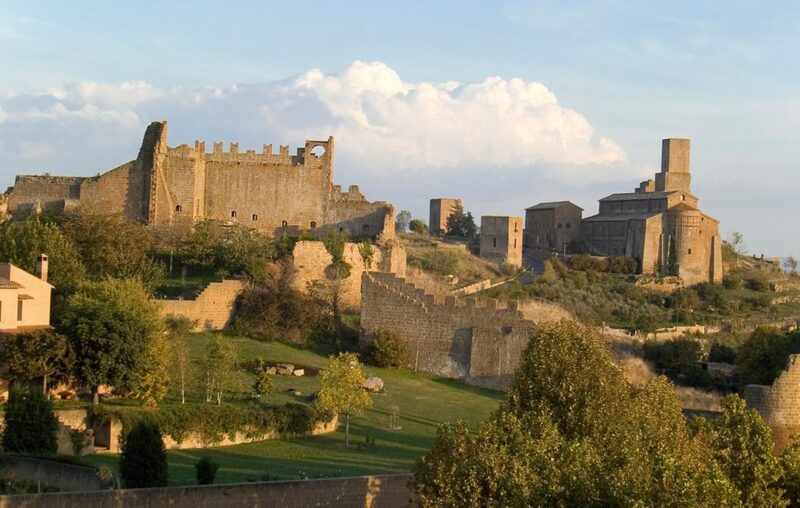 Tuscania is the main town close to the event, and the biggest city nearby is Viterbo. From Viterbo to the location is only 30 minutes drive. coming from Viterbo, follow the road towards Tuscania. coming from Tuscania town centre: follow towards Vetralla. CIVITAVECCHIA – Tuscania – Festival. All Bus will take you to Tuscania. Once there, you will be able to get a shuttle to the festival. (Bus will pass every 40 mins c.ca. Last bus ride is at 6PM). VITERBO and CIVITAVECCHIA are the suggested train stations, as from there, it is easier to find a bus to Tuscania. from ROME: FIUMICINO AIRPORT is only 60/80 mins away, 116 km. Once out of Fiumicino Airport, follow directions for Civitavecchia. From Civitavecchia continue towards Montalto di Castro. Montalto di Castro – Tuscania. Once you arrive in Tuscania, take SP Vetrallese, after 4km on the right hand-side, will be the location of 7 Chakras. We are surrounded by a beautiful landscape, in the middle of ancient villages and magnificent coasts. Ancient Etruscan city, its walls are more than 4000 years old, and the town center still shows all its original buildings: castles, cathedral, and charming stone houses. Visit the picturesque village of Tuscania, it will be like traveling back in time, while enjoying foods and recipes of the local tradition. The area in which 7 Chakras Festival 2019 is held is a place with great mineral resources. 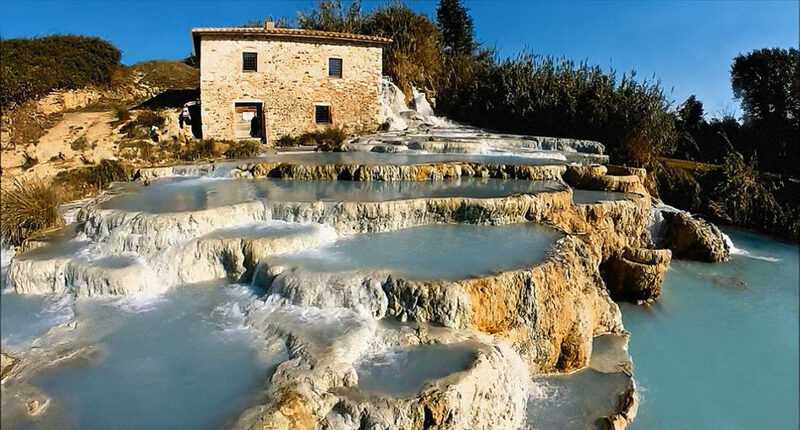 This conformation has allowed since ancient times, to take advantage of the beauty of the natural spa. What’s better than Hot water with healing properties that flows into waterfalls and pools? In less than 30 minutes by car (30 km) we can reach the sea, and from the first beach we meet, it starts one of the most beautiful coasts of Italy. 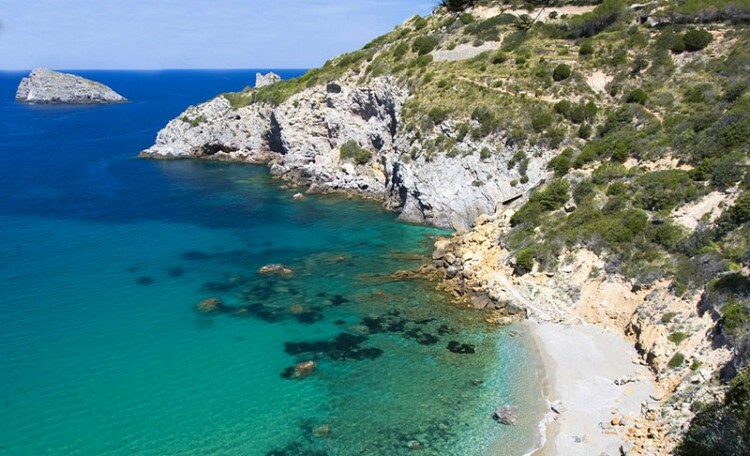 A spectacular panorama of the Maremma region, its coastline is characterized by crystal clear waters and dense Mediterranean vegetation, and presents breathtaking landscapes and views. At 80 minutes, we arrive at Cala del gesso. An inlet of rocks and polished pebbles, a very rich backdrop to explore, crystal clear sea … a real corner of paradise! The Argentario beaches are all very small, perfect for spending a few days relaxing before and after the festival. Surely one of the most beautiful seas in Italy but also a green vegetation, full of pine forests and shaded spaces. 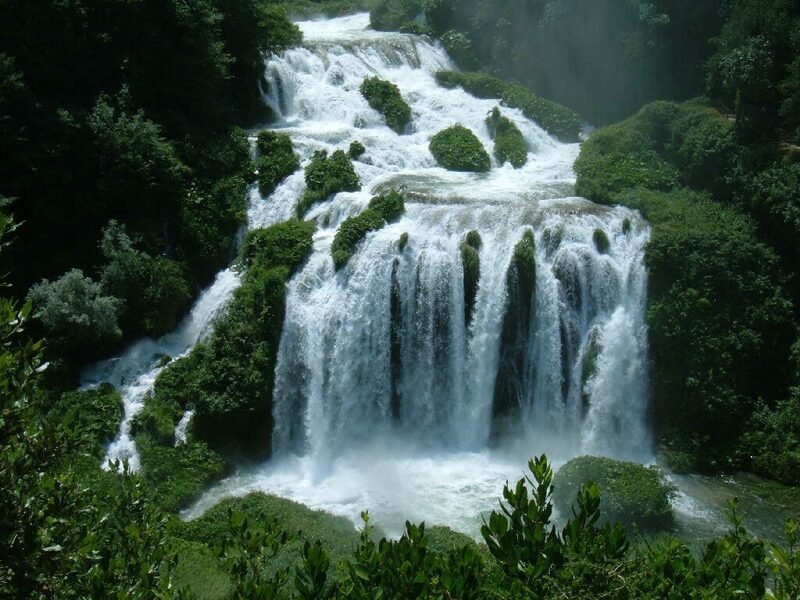 The Cascate delle Marmore is one of the most spectacular waterfalls in Italy and one of the highest in Europe: the highest point and the lowest point are separated by a difference in height of 165 meters, in which there are three jumps of great beauty. The waterfall is immersed in a park of waterfalls, where paths and paths wind through, where you can also see archaeological works and hydraulic works. Il Giardino dei Tarocchi è un parco a tema caratterizzato dalla presenza di 22 sculture, fatte di specchi, vetri e ceramiche, che rappresentano i 22 arcani maggiori dei Tarocchi: le opere sono dislocate lungo un percorso (spirituale) fatto di citazioni, messaggi e pensieri. Il parco, ritenuto da molti una vera e propria opera d’arte a cielo aperto, è un connubio perfetto tra arte, natura e spiritualità. Le sculture hanno un’anima di acciaio e cemento, e sono rivestite esternamente e internamente da mosaici di specchi, vetri pregiati e ceramiche colorate. 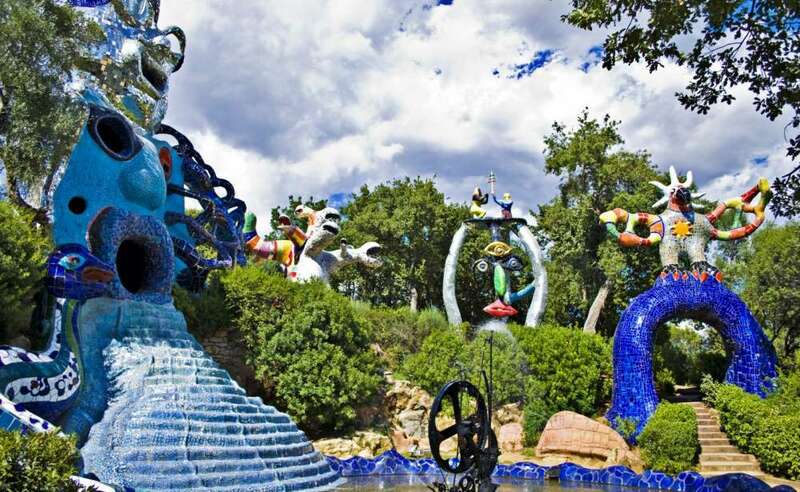 Ispirata dal Parque Güell di A. Gaudì di Barcellona, l’artista franco-statunitense Niki de Saint Phalle ha individuato in un piccolo terreno in Maremma di proprietà di amici il luogo ideale per far nascere il suo giardino fatto di sculture e per far apprezzare a tutti l’arte. The Monster Park? It’s a journey through secrets, enigmas and wonders of a unique forest in the world! 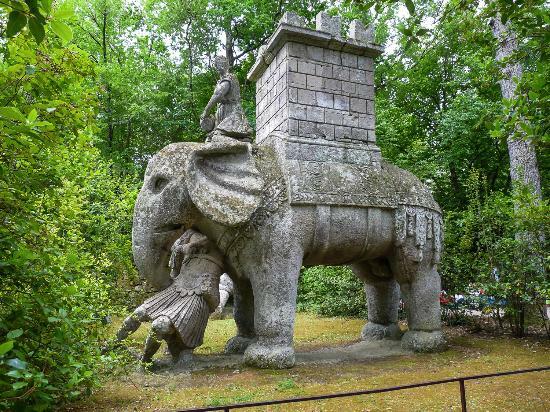 Bomarzo stands in a valley dotted with huge blocks of volcanic rock, intricate in the vegetation, in the roots of oaks and holm oaks. There is a very suggestive atmosphere! This alchemic giardo is populated by animals, mythological beings, talking statues, masks, carved directly into the lava rock protruding from the ground. Above all being and construction, there is the Temple, sacred. The grove is made to be crossed and where, you will be invited to face trials! As for example, enter the Leaning House. I assure you that you will experience a special effect! If you love fantasy, like us, you will know that in Narni and its surroundings there are the places that inspired “The Chronicles of Narnia”. The Mole di Narni lie close to the Gole del Nera, just a few kilometers from Narni and Stifone. 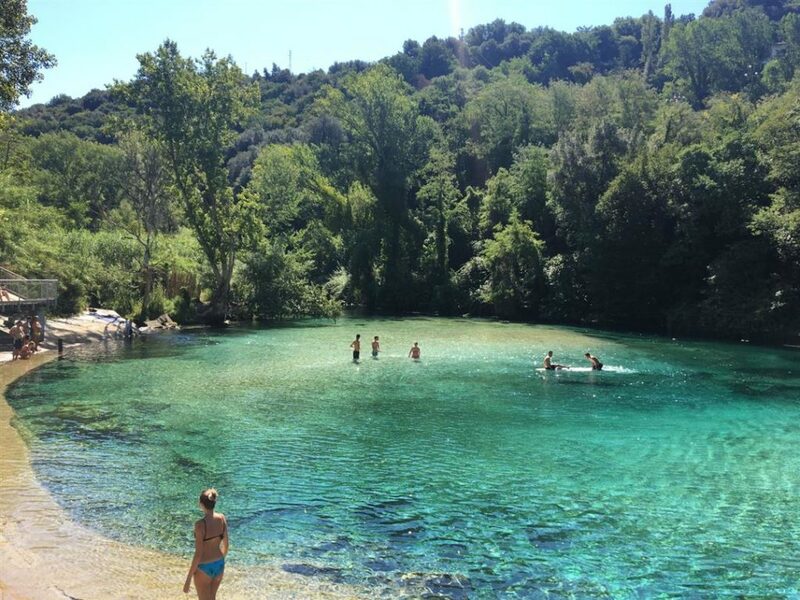 In this place there is a hidden jewel: a narrow valley in which the Nera flows, creating a natural pool with water that dissolves in wonderful turquoise and emerald shades. It is so clear that the rocks can be glimpsed, creating striking contrasts. 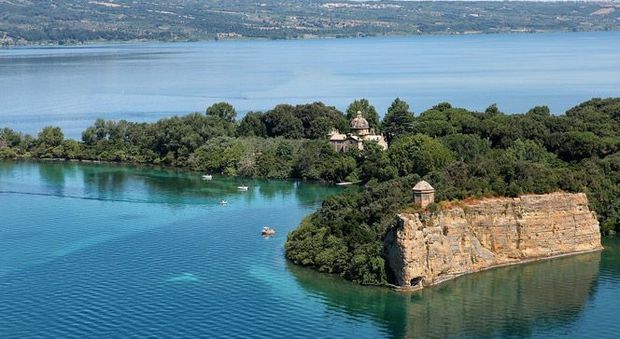 The large body of water of Bolsena Lake that with its 114 square kilometers of surface is the largest volcanic lake in Europe, draws its origins hundreds of thousands of years ago, when in the territory of recent formation they created fractures that caused explosions, with ashes, lapilli, pozzolane and large lava flows. The waters of Lake Bolsena, already clean, due to the absence in the surrounding areas of polluting industries and the presence of numerous underwater springs, are today particularly clear and clear thanks to an impressive and sophisticated purification system managed by a consortium of Municipalities belonging to the lake basin. The mild climate is particularly suitable for children and the elderly.